Nothing too fancy about this flan. 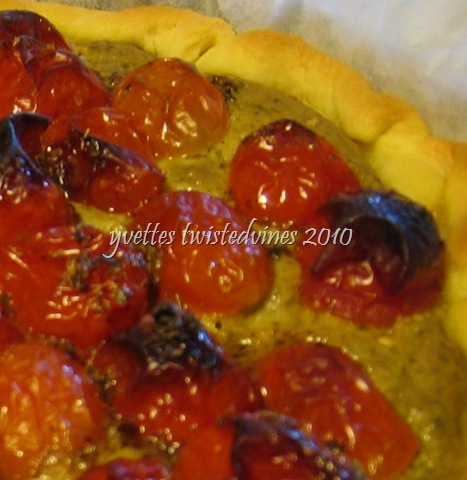 I used ready made short crust pastry. 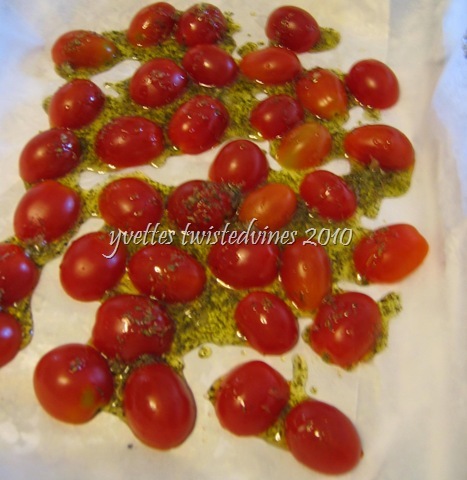 Heat the oven to 180° C. Cut the cherry tomatoes in half placing seeded side down on oven proof paper on a baking tray. In a bowl mix the olive oil, oregano, grated garlic , salt and pepper. 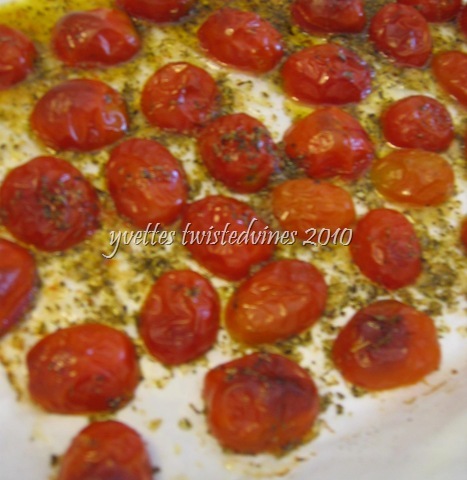 Pour over cherry tomatoes and slow cook for about 80 minutes. Checking every now and again, they need to remain a brilliant red colour, and remember you’re not making tomato sauce. Using a fork prick the outer skin of the eggplants, cook in oven 180° C for about 45 minutes, until soft.Remember we’re not making soup…Leave to cool. 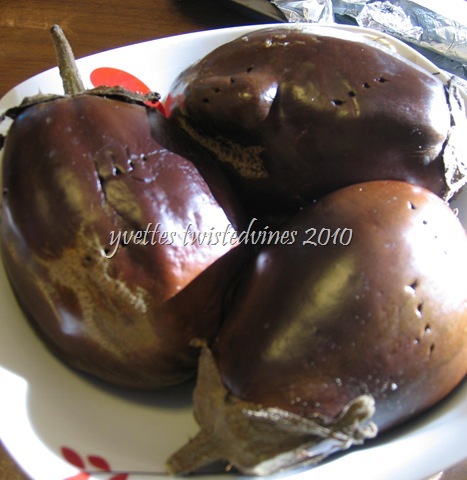 My hint…Short Cut: Prepare the skins of the eggplant the same way, place in microwave dish,cook on high for about 12 minutes in the microwave allow to cool. Cut cooled eggplants in half scoop out the center pulp and place in mixer. Add grated garlic,paprika,oregano,eggs,salt and pepper. Mix all the ingredients until creamy. Place 1 round sheet of short crust pastry on oven proof paper in a 25cm round flan tin. 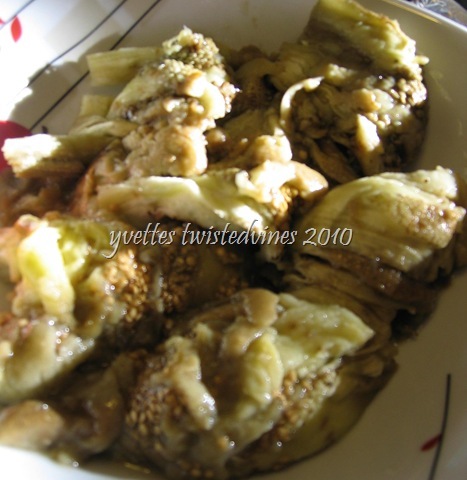 Pour the creamy eggplant mix into pastry shell, cook in oven for about 25 minutes. 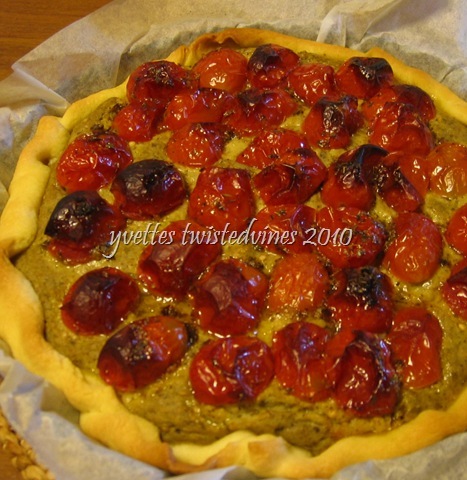 The eggplant mixture will firm.Decorate with prepared cherry tomatoes. This looks good! I haven’t ever tried eggplant but there seems to be a flurry of recipes of late using it…I guess I will have to start giving it a go. Thanks for sharing! There are just so many ways of preparing eggplant…and when your garden is overflowing…I think I’ve tried every way this season!Thanks for stopping by!